In this lecture ´´Shock´´ is explained. Section one is about ‘‘Pathophysiology’’. Educator begins by explaining the concept of shock. Then thoroughly discusses it pathophysiology. Following this, information about microvascular is given. Likewise, cardiovascular, respiratory, and renal is pursued. Afterwards, endocrine is elaborated. In the end of this part, ischaemia-reperfusion syndrome is highlighted. Section two is about ''Classification''. Prime emphasis is on classification of shock. Discussion continues on hypovolaemic shock. After that cardiogenic shock comes under consideration. Subsequently, obstructive shock is elaborated. distributive shock is discussed later on. Moving onward, endocrine shock is pursued. At last, educator comments on cardiovascular and metabolic characteristics of shock. Section three is about ''Severity and Stages''. Initially, severity of shock is discussed. After that educator talks about compensated shock. Then discussion continues on decompensation. Likewise, light is shed on mild, moderate and severe shock. Furthermore, capillary refill is elaborated. Alongside, educator notify about tachycardia. In addition to this, information about blood pressure is delivered. Unresuscitatable shock is highlighted later on. Concluding comments are given on multiple organ failure. Section four is about ''Resuscitation''. In the beginning, educator talks about resuscitation. After that conduct of resuscitation is discussed. Fluid therapy is then explained comprehensively. This is followed by elaboration of type of fluids. Next, dynamic fluid response comes under consideration. Furthermore, educator focuses vasopressor and inotropic support in this part. Section five is about ''Monitoring''. 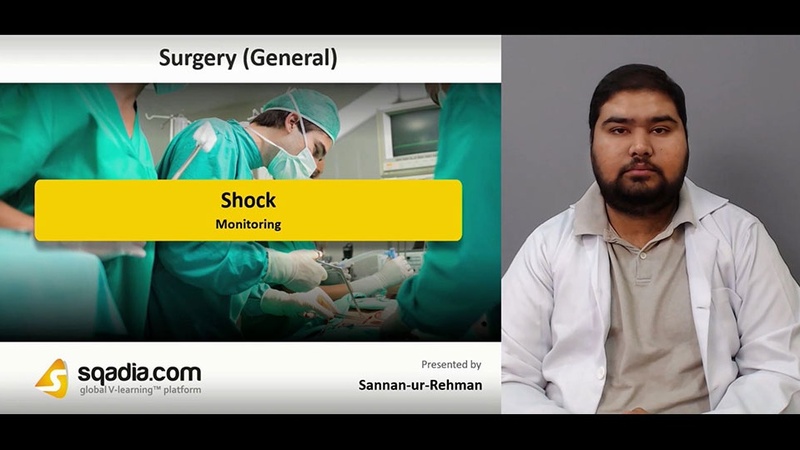 Primarily, educator tells about monitoring for patients in shock. The aspects that are considered for monitoring include cardiovascular, central venous pressure, and cardiac output. Furthermore, systemic and organ perfusion is also elucidated. Then educator moves towards the explanation of base deficit and lactate along with the discussion of mixed venous oxygen saturation. Lastly, end points of resuscitation are covered in this part.